117. 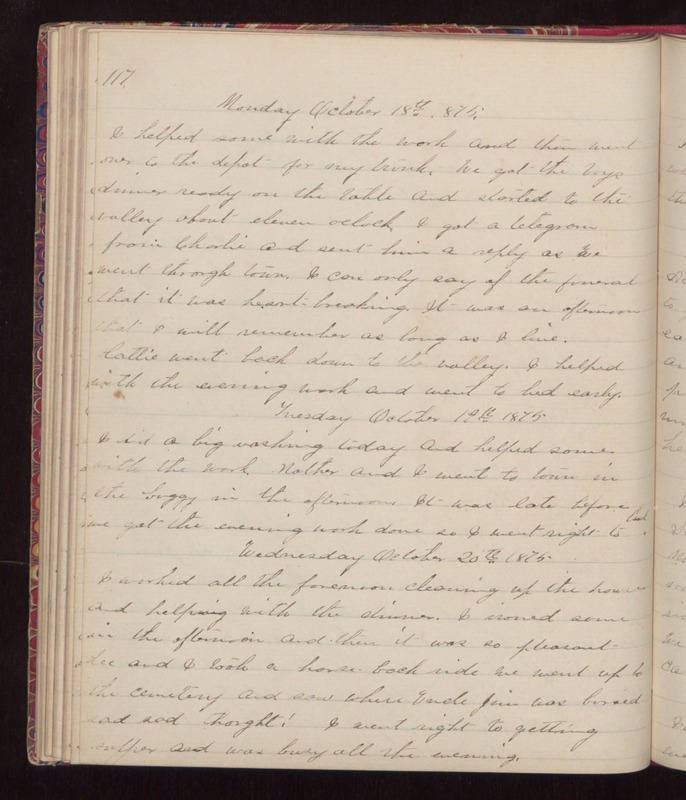 Monday October 18th 1875. I helped some with the work and then went over to the depot for my trunk. We got the boys dinner ready on the table and started to the valley about eleven oclock. I got a telegram from Charlie and sent him a reply as we went through town. I can only say of the funeral that it was heart-breaking. It was an afternoon that I will remember as long as I live. Hattie went back down to the valley. I helped with the evening work and went to bed early. Tuesday October 19th 1875. I had a big washing today and helped some with the work. Mother and I went to town in the buggy in the afternoon. It was late before we got the evening work done so I went right to bed. Wednesday October 20th 1875. I worked all the forenoon cleaning up the house and helping with the dinner. I ironed some in the afternoon and then it was so pleasant Lee and I took a horse-back ride We went up to the cemetery and saw where Uncle Jim was buried sad sad thought! I went right to getting supper and was busy all the evening.